Invest in MJ is the leading source of investor information on the medical marijuana and cannabis sector. You will find the latest investment related topics about the marijuana sector including industry news, company information and press releases, blogs, discussions and articles by industry experts. The medical marijuana and the cannabis industry is a sector with huge growth and investment potential, learn more about the companies who are industry leaders or looking to enter the MJ space. Visit our website for a full company directory listing of the companies in the medical marijuana industry. View our real time investor watch list portfolio of publicly traded companies and review the current share price, 52 week high, 52 week low, yesterdays’ closing price, shares outstanding and market capitalization. We also provide coverage on private companies looking to go public and possibly seeking funding. Join the Invest in MJ Community, a rapidly growing network of investors interested in the best medical marijuana and cannabis sector companies. You can connect with other investors, create your own blog and discussions or even start your own group. As Canada moves towards legalization, next year should be an exciting time for investors in the cannabis industry. Here we look at Emerald Health Therapeutics, a licensed producer in Canada with interesting growth prospects. E Interview With Vitality Biopharma Inc.
We recently had the pleasure to speak to Robert Brooke, the CEO of Vitality Biopharma, a publicly traded pharmaceutical company focused on cannabis based medical drugs, and their recent R&D breakthrough for those suffering from IBD & Crohn's Disease. The Canadian cannabis sector continues to be blazing hot over the last year, especially in the last 2 months. There is a clear breakout above overhead resistance, and this means we are in a new bull market for cannabis stocks in Canada. Licensed cannabis producers in Canada have seen great appreciation in stock prices over the last few months. Now what? Is it time to sell, hold or buy more? Invest In MJ predictions for 2016 on the medical marijuana and hemp sector. This is based on the Canadian MJ sector experience during the elections and how the US listed companies could trade leading up to the US elections. Video Interview: Vin Maru speaks with Joe Brunner from SmallCap Investor and IRW-Press about the global legal cannabis market, how investors can participate and the general outlook of the marijuana industry. Hi Joe, you can sign up for our newsletter, we review and discuss opportunities there. Soon, we will be starting a subscriber based paid newsletter where we will provide more coverage on the sector. We have many of the Canadian Licensed producers list in our Grower directory on our site, many of the are publicly traded... see http://www.investinmj.com/directory/growers for more details. We are starting to build out a comparison chart so visitors can evaluate the various companies, see www.investinmj.com/.../licensed-producers-comparison. Our focus at #IMJ has been on the Cnd side because of federal support, but we will be providing more coverage on US opportunities soon, sign up for our newsletter. To learn more about the industry, you may want to attend conferences, webinars and meetups, check out http://cannabisconference.ca As for recommendations, we are research analysts and provide coverage on the sector, we are not financial advisers. We will be starting a subscriber based newsletter soon, it will be a paid newsletter that will share opportunities and more in depth coverage. In Canada, the risks are greatly reduced as the Federal Govt is moving towards legalization, the US can be risky given the Govt stance on #cannabis. The risk in Canada is more on the company valuations being so high, competition and the increase in the number of licensed producers expected in the coming years. 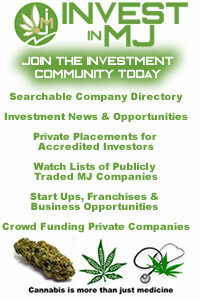 You can visit our site at www.investinmj.com and sign up there for the newsletter. We are still conducting further due diligence on the company and will be sharing our findings in our newsletter. At the moment, I do not have a position in the company. We agree, there are going to be some great opportunities over the coming year... however due diligence on the companies is necessary. Anyone involved in the cannabis industry has always been at risk, whether it be the legal medical market or the illegal grey market. This is mostly as a result of the failed “War on Drugs” policy by the US federal government and the anti-marijuana crowd’s lack of information and honest truth about cannabis as a medicine. Misinformation and $20 billion/year spent on drug policy control have been the means to suppress marijuana as a viable industry, however they are losing on the propaganda front and progress towards legalization is being made. The industry is being accepted by the majority of people and the move towards legalization is happening a worldwide, it really is just a matter of time until the Fed gov’t caves in. As the move towards legalization progresses, the industry risks decrease and the value of established business should increase. Yes, this is problem while the industry is still illegal at the federal level. However we are optimistic that it this will be addressed over the coming years as more states start to legalize it. The federal gov't can't ignore the movement to legalize this industry much longer, they are losing the war on drugs and will eventually have to cave in and legalize the medical marijuana market and eventually the recreational market. Yes the industry is still in it's infancy when it comes to investments. The rules and regulations in the US at the federal level still make it difficult to navigate investment opportunities until they become clear or the industry is fully legalized at the federal level. However the risks taken now can and will pay off handsomely if full legalization nationally becomes a reality. The stock prices of many of these companies have come down significantly in the past year making them cheap, however as you suggest, some are sketchy and not worth investing. For now, look for companies who are generating revenues and can grow their business, especially in the vertical markets. There are many private investment opportunities that also look very promising, but they take a lot more due diligence to find and research, but we believe that is where the most promising upside lies. As many of you know, we are very bullish on the Marijuana sector for the coming few years and recently published our outlook on the sector, we feel the best way for you to participate is in early stage Pre-IPO companies.